While we are well aware it is no longer ‘midweek’, now is a good a time as any to consider the impact that Dragon Age Inquisition, ‘…the most successful launch in BioWare history.’, (Andrew Wilson, EA CEO) could have on the next Mass Effect game, so strap in for some wild speculation! Just as warning, there are some mild spoilers for the Mass Effect games, but nothing critical that would spoil the experience for anyone unfamiliar. seeing a Krogan ride a nug. That said, Bioware has always iterated on ideas and concepts, design and mechanical, bouncing them between their games and downloadable content wherever it made sense to. Dragon Age II for instance, was heavily influenced by the direction the Mass Effect franchise was taking; by becoming more accessible, more action-focused, using the same dialog wheel, and a named (voiced) protagonist. 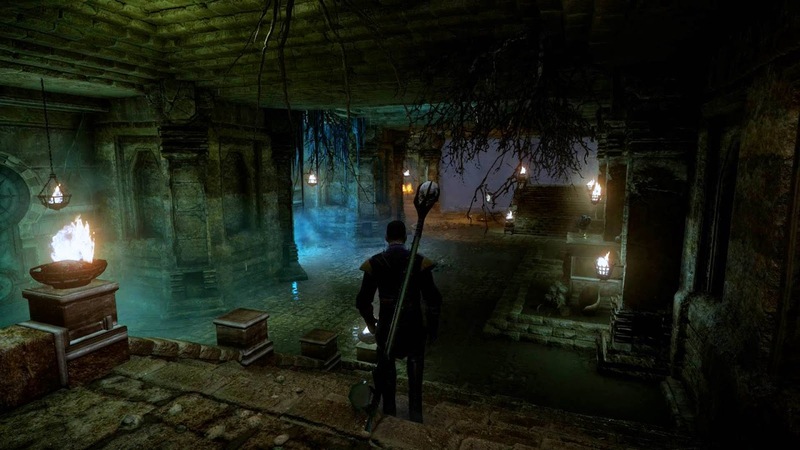 Don’t shudder too much, Dragon Age II’s real issues had little to do with these changes, and all of these ideas were iterated on once again in Inquisition. With that in mind, let’s take a look at some of the new and improved elements introduced in Dragon Age Inquisition that we would love to see expanded upon further in the next Mass Effect. Inquisition presents its open world in a piecemeal fashion; it contains many large and very rich environments, which vary greatly in appearance and atmosphere. Mass Effect 2 and 3 are spilt up similarly, but the environments are much smaller and very linear. So let’s extrapolate the Inquisition’s open world to a galactic scale, the new Mass Effect seeks to, ‘…fulfil the original promise of that [Mass Effect (1)] gameplay.’, as Flynn pointed out; a galaxy filled with planets to land on and explore. Rather than the barely habitable chunks of rock found in the original Mass Effect, one would hope that the planets of the next game are as unique and rich as the environments in Inquisition. The notion of undertaking expeditions and setting up bases on distant, strange planets, in a manner similar to camps in Inquisition is exciting, and not beyond the realms of possibility. When discussing the next Mass Effect, exploration has been Bioware’s watchword, and the promise of increased scale by hinted at by Flynn, ‘…dropping the older consoles has had more impact on the overall gameplay goals…’, makes it even more enticing. 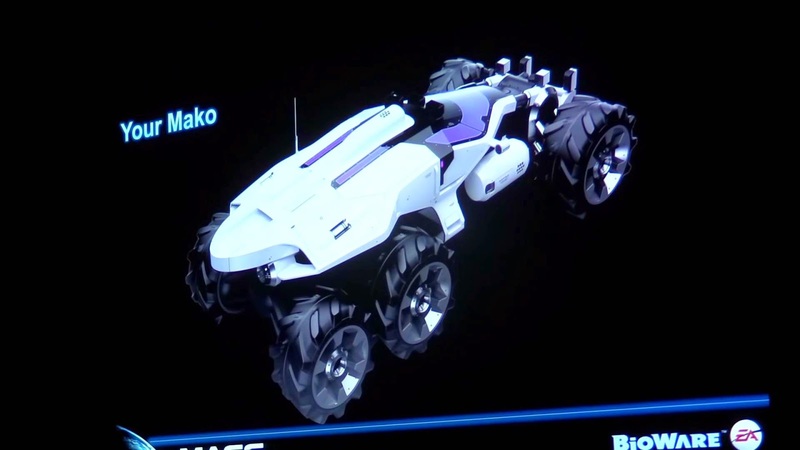 Bioware showcased the return of the Mako at their Comicon 2014 panel. The Mako was Mass Effect’s divisive troop transport; it had very questionable physics and lacked the ability to sufficiently adjust the angle of its turret. It made return of sorts in Mass Effect 2’s Firewalker (and Overlord) downloadable content as the Hammerhead, but was not utilised outside of cutscenes in Mass Effect 3. In the context of exploring larger environments the speed and maneuverability of the Mako is essential, just as mounts were in Inquisition. To that end, the Mako concepts did not show any armaments. Unlike the mounts, the Mako easily explains away your party mysteriously vanishing, and the lack of fall damage. In Mass Effect (the original) the decision at the end of the game is completely swept aside at the beginning of Mass Effect 2. In Mass Effect 2 you will work for Cerberus, your final decision is just as meaningless, sure you will get a different codex entry and a few throwaway lines of dialog, but that is it. And by Mass Effect 3, Udina will be on the Council and Shepard’s allegiance is made quite clear. So I found it highly ironic that it was not until Mass Effect 3, the game that ends the trilogy, ends the story of Shepard, that a large, or at least very vocal number of players, decided to question the true impact of your decisions. 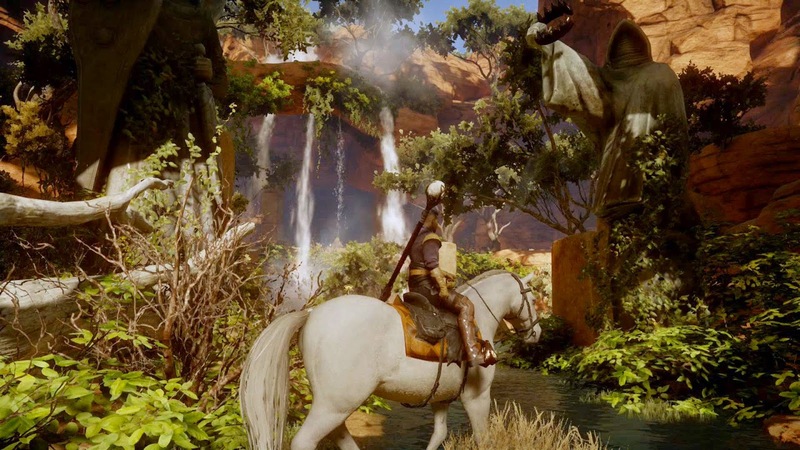 Dragon Age Inquisition works at a scale far larger than any of the individual Mass Effect games and succeeds in creating truly meaningful decisions. Admittedly, the companion’s loyalty missions and the permanent deaths in Mass Effect 2 were hugely meaningful, but also wholly avoidable. In what is effectively the first act of Inquisition you choose whether to side with the Templars or Mages. Mass Effect 3 has you making similar choices, between races rather than factions, which dramatically change how certain characters treat you, as well as some cutscenes. In Inquisition, this choice changes all that, and so much more; you undertake a completely different main story quest, both sides of which are fantastic, it affects who is the primary enemy faction in the later story missions and there are new specific side quests that open up. 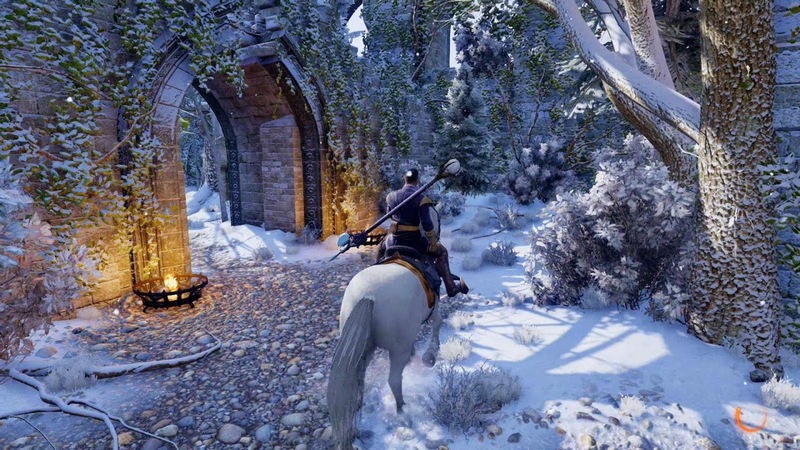 The choice echoes split of the story in The Witcher II: The Assassin of Kings. There are also huge ramifications for the world of Dragon Age after the main story, but we will have to wait for additional content or a sequel to see if they make good on that. A staple of Bioware’s role playing games is the home base, whether starship, camp or castle, the player must have a (relatively) safe haven to return to. In Mass Effect 2, the Normandy, Shepard’s base of operations, can be upgraded with new armaments and defences, which is key surviving the event of the closing battles. Mass Effect 3 has similar but far less important upgrades as part of the Galactic Readiness. The Normandy never reflects the upgrades or your decisions in the story, but Inquisition’s Skyhold very much does. 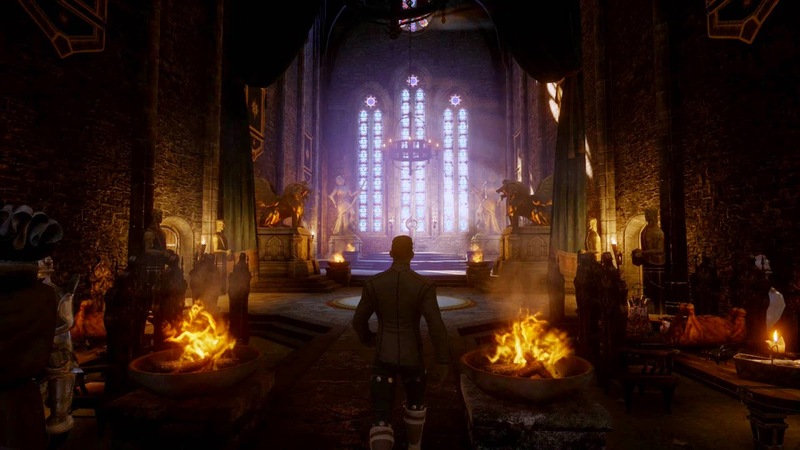 Skyhold is the Inquisition’s keep, itself an evolution of Vigil’s Keep (in Dragon Age: Origins - Awakening), which could be upgraded, and even introduced the concept of judging prisoners. There are a few large upgrades to be undertaken in Skyhold, like reconstructing the main tower, which can be gifted to one faction or another, but there is an extensive selection of smaller customisation options. Changing the designs of banners, glass, ornamentation, the Inquisitor’s seat, and far more, may seem like minor points, but such customisation is an extension of the player’s character, which I found highly rewarding. That Shepard had a virtually blank cheque from the Illusive Man and didn’t choose to redecorate the Normandy interior to resemble Omega’s Afterlife, is a crime that must be fixed. No two of Bioware’s games have shared the same equipment management and customisation systems. The Mass Effect series moved from a cluttered loot-fest, to a highly limited armoury in 2, before settling on the mod-focused middle ground of 3. Dragon Age Inquisition on the other hand, implemented a crafting system which added weight to resource collection, a weight which the Mass Effect series, with all its tedious mineral scanning, never had. In Inquisition, both the attributes and appearance of armour and weapons change, based upon the materials used. Armour and weapons can be modified with upgrades that also require crafting, these upgrades affect the item’s appearance much like Mass Effect 3’s weapon customisation, only with more flexibility. Inquisition’s tactical camera pauses time, pulls the perspective out and allows the player to issue instructions to each party member before resuming battle. It also displays the strength and weaknesses of the enemies on the field. Although the tactical camera is closer to the almost isometric view available in the PC version of Dragon Age: Origins, the Mass Effect games also allow the player to pause time and issue orders to party members. However, in Mass Effect you traditionally only have direct control of Shepard, but Dragon Age allows you to play as any party character. The tactical camera seems like a natural upgrade to Mass Effect’s previous party management. It would be awesome to see the characters of the next Mass Effect, specifically party companions, be as diverse and well realised as those in Inquisition. Many of the vocal fans of Mass Effect appear to have a nasty tendency to don their rose-tinted glasses when looking back to the original game; it doesn’t matter how you spin it Garrus was never interesting. Shepard’s crew weren’t fleshed out properly until the dark middle chapter, Mass Effect 2, in part due to the singular focus provided by the loyalty missions. The characters of Inquisition develop and interact with one another in a far less mechanical manner; they can be as humorous as those in Mass Effect 3 Citadel, or as hot-headed as Ashley/Kaiden in Mass Effect 2. In Inquisition, the characters have a great range, they have their own beliefs, problems, ways of living; they feel more like living people and less like videogame characters. More Dorian, less Cortez, basically. Character creation is huge part of many role playing games, and certainly all Bioware ones. Dragon Age: Origins allows the player to choose from different races (human, elf, and dwarf), each with several unique origin stories, these are playable sequences that can hugely change how other characters react to the player. Inquisition goes a step further (though it doesn’t have unique openings like Origins) and introduces the half-giant Qunari, who look a lot less human than elves or dwarves. Clearly, Mass Effect has a few more races it could choose from, but as exciting as role playing a human-hating Turian would be, it doesn’t fit so readily into the style of storytelling style we’ve seen in the Mass Effect series. In all Dragon Age games you are quite independent, Inquisition especially. So while people judge you by your race (and class, specifically as a mage), and there are different opportunities and relationships available to different races, the nature of the Inquisition allows for the player to be any race. In the Mass Effect series Shepard is human, always working for humans, though you can choose Shepard’s origin, it does not amount to much. Based on what little was eluded to at Comicon 2014, it looks as if the player character will be human. 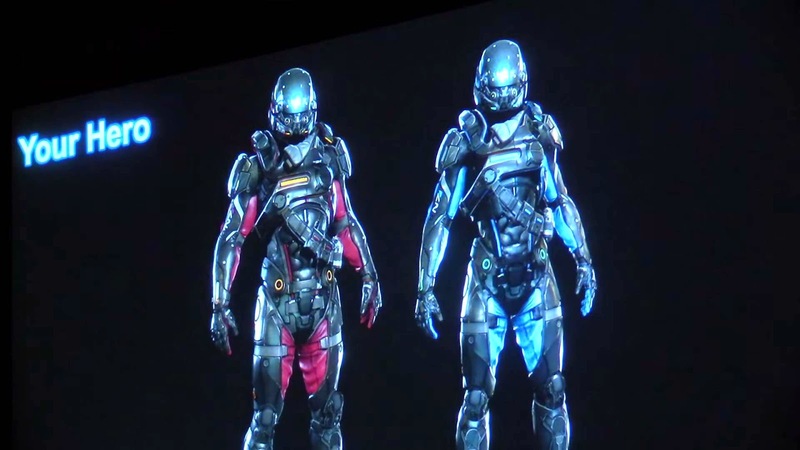 One of the slides presented by the Bioware panel showed character models, called ‘Your Hero’ (seen above), that were confirmed as humans, the armour also bore an N7 symbol. Mike Gamble later mentioned during the question and answer session, that while the main character is human, they have not locked down further playable races. 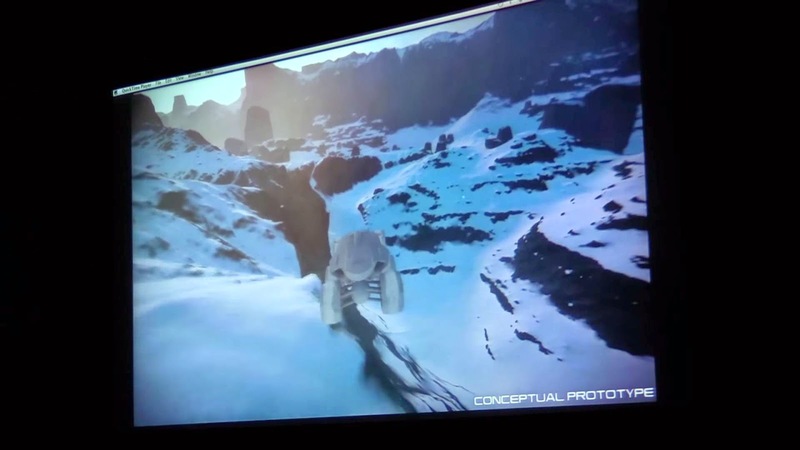 The next Mass Effect will run on the Frostbite (3) engine, just like Dragon Age Inquisition, and perhaps soon every EA game, on consoles at least - though Frostbite Sims would be something. Frostbite’s visuals are some of the best in class, Inquisition’s environments were a clear demonstration of this; breathtakingly beautiful and surprisingly varied. In the context of the different planets in Mass Effect the visual spectacle becomes truly exciting; storms obscuring vision, lighting and lens flare, water effects like wet cave walls (Inquisition features the finest I’ve seen). Aside from graphics, Frostbite has yielded some impressive destruction physics. Though in recent releases this has been used sparingly, it has been demonstrated best in the Battlefield series, where walls, floors, and in some cases entire buildings, can be blown out and collapsed. In Inquisition, barricades and some rock formations would shatter and crumble if hit with sufficient impact, which is always cool to see happen. Mass Effect’s cover based combat offers potential for some small scale destruction, and perhaps larger scale during set-piece moments. Once again with the previous generation of consoles left behind, the potential grows. Did you play Dragon Age Inquisition and feel there are other ideas or features that could be adopted by the next Mass Effect title? Or do you feel Mass Effect should avoid the trappings of Inquisition entirely? Let me know!